According to a new report titled ‘Gas Detection Equipment Market – Global Industry Analysis, Size, Share, Growth, Trends, and Forecast, 2018 – 2026,’ published by Transparency Market Research , the global gas detection equipment market is expected to reach a value of US$ 5,537.56 Mn by 2026, expanding at a CAGR of 4.7% from 2018 to 2026. Volume share of the global gas detection equipment market is expected to reach 5,435.66 thousand units by 2026, at a CAGR of 4.1%, during the forecast period. Asia Pacific held a prominent share of the global gas detection equipment market in 2017. Adoption of gas detection equipment has increased throughout the world due to government regulations and environmental safety and security standards implemented across applications such as emergency services, water treatment, chemicals & specialty chemicals, mining, food & beverages, power, building automation & construction, and others. Demand for gas detection equipment is also increasing in order to maintain good air quality, identify hazardous gases, especially in commercial buildings, and avoid critical incidents or situations. This is expected to drive the gas detection equipment market during the forecast period. Furthermore, rising number of distributors across regions such as Asia Pacific, Middle East & Africa, South America and North America is expected to boost the adoption of gas detection equipment during the forecast period. As such, these factors are anticipated to drive the gas detection equipment market during the forecast period. However, entry of new players in the market offering competitive prices has compelled established players to offer their products at reduced prices too, thereby hampering their profit margins, resulting in decline in investment in the market during the forecast period. Based on product type, the portable gas detection equipment segment exhibits significant growth opportunities as these detectors are light in weight and can easily be worn or attached to a belt for monitoring of the user’s breathing zone. Such features make the portable gas detector equipment segment highly attractive during the forecast period. In terms of gas type, the toxic gas detection equipment segment is expected to maintain its leading market share owing to factors such as increasing adoption of gas detectors in shale gas exploration and rising awareness regarding risks associated with hazardous gases. By technology, the multi-gas detection equipment segment is expected to exhibit the dominant CAGR during the forecast period as these monitors can detect different gases simultaneously and help comply with the confined space regulations and worker safety guidelines. The gas detection equipment market in Asia Pacific is expected to expand at a higher CAGR compared to other regions due to estimated increase in the number of Greenfield projects in the region during the forecast period. 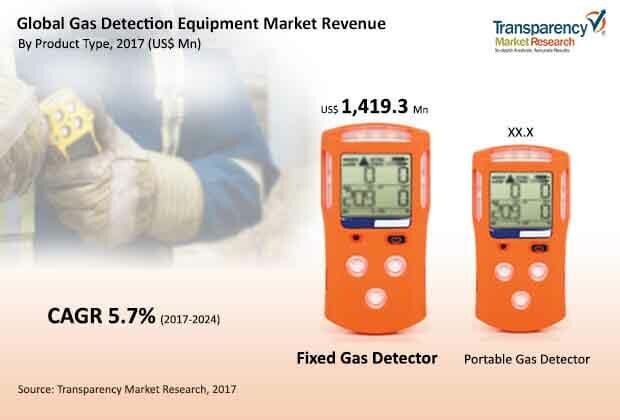 The gas detection equipment market in China is expected to reach a value of US$ 677.0 Mn by 2026, expanding at a CAGR of 6.2% during the forecast period. This can be ascribed to the increase in adoption of gas detection equipment across industries in the country for providing safety to the workforce. Furthermore, rise in investment across countries is driving the market for gas detection equipment in Asia Pacific. Technological advancements and new advanced products introduced by gas detection equipment companies are also expected to boost the demand for the product from various industries and applications across the Asia Pacific region. In terms of industry vertical, the mining and oil & gas segments collectively held a prominent share of around 25.9% of the global gas detection equipment market in 2017. Adoption rate of gas detectors is high in marine applications due to regulations and policies associated with the safety of workers. Moreover, rise in the number of gas detection device manufacturers and distributors across developing countries such as India and China is anticipated to boost the demand for gas detection equipment. These factors are expected to drive the gas detection equipment market between 2018 and 2026. Companies in the gas detection equipment market are focusing on achieving sustainable growth by providing value-added services to customers. The company profile section of the report includes company overview, major business strategies adopted by the companies, and their recent key developments. Key players profiled in this report include Riken Keiki Co., Ltd, Industrial Scientific Corporation, Drägerwerk AG & Co. KGaA, MSA SAFETY INCORPORATED, Siemens AG, Honeywell International Inc., RAE Systems Inc., General Electric Co., Emerson Electric Co., Thermo Fisher Scientific Inc., ESP Safety Inc., Sensor Electronics, Trolex Ltd, Tyco International, and Airtest Technologies.